Nissan Silvia (S12). 1983–8 (prod. n/a). 2- and 3-door coupé. F/R, 1809, 1974 cm³ (I4 OHC), 1809, 1990 cm³ (I4 DOHC), 2960 cm³ (V6 OHC). Silvia gains in the style stakes, with better performance, fuel economy and safety. Pop-up headlights. Twinned again with Gazelle. Turbocharged models popular on home and export markets. 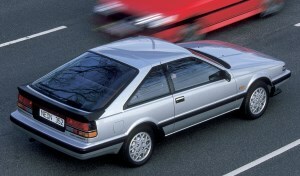 Exported both under its home-market name and as 200SX. V6 for North America, as 200SX SE. Mid-term changes 1986.